In the previous post we looked at a special kind of view file called _ViewImports.cshtml. It is special in a way that MVC knows about this file and will pick it up during execution. We don’t need to register the file anywhere, we just need to put it in a folder where the views are stored. The view imports file has a very specific role. We can put a number of C# using statements that will be executed in all view cshtml files where the view imports file is applied. We can have multiple _ViewImports file in the project. We can have one in each folder containing the views, like /Views/Books, /Views/Customers etc. and each view file in those folders will pick up the view imports file in that folder. We can also have an overall view imports file in the Views folder as well. That imports file will be applied to every single view within the Views folder and its subfolders. 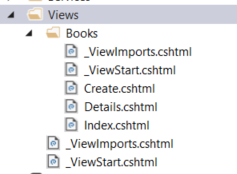 In this post we’ll look at another special file called _ViewStart.cshtml. We’ll also talk a bit about the layout file since it is strongly related to the view start file. The view start file is similar to _ViewImports.cshtml. It is also a file that MVC knows about and picks up automatically without any registration. It too can be placed in each views subfolder and one in the Views folder itself. The views start file will be executed before the views. It can contain a C# code block which MVC will run before processing the cshtml files. This is views start executing in the views/books folder!!! This is views start executing in the root Views folder!!! The root _ViewStart.cshtml file was executed before the more specific one. The main usage of the _ViewStart file is to declare the layout file for the views. The layout file contains common markup for the views such as the navigation bar, a footer, a side bar etc. If there’s no common layout file then we have to duplicate a lot of markup in each cshtml file. A layout file is commonly called _Layout.cshtml but this is not a must. In contrast to the view start and view imports files the Layout file must be declared in code, it won’t be picked up by MVC automatically. It’s possible to have multiple layout files and apply them for each view file separately. The common layout file must be placed in a folder called Shared within the Views folder. You may remember the Shared folder from an earlier post. MVC will search the subfolders of the Views folders for a matching controller. 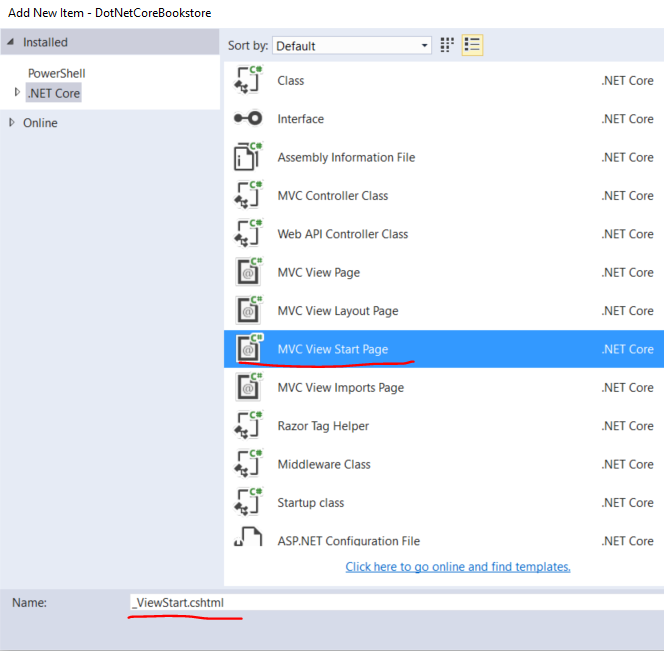 MVC will also search the Shared controller which is accessible to other views as well. The name of the layout file can be anything, but it’s customary to call it _Layout.cshtml. ViewBag is a dynamic object which can have any property attached to it. We’ll see an example soon how to assign the title from the view using ViewBag. Keep in mind that ViewBag is sort of a dynamic container of properties where Title is a widely used one to store the title of the page. We set the title of the page using the ViewBag dynamic object. This will be picked up by the layout file. Notice that as you type “ViewBag.” in the editor it won’t give you any IntelliSense. This is due to the dynamic nature of ViewBag. If you’re new to this then read the post referenced above for a short intro. Run the page and check the HTML source of /books. You’ll see all the elements from the layout page and the index view. It’s perfectly fine to have multiple different layout pages in the application. The C# code block in _ViewStart.cshtml can contain if-else statements to decide which layout to use. E.g. you may want to have a different layout based on the current season. Check which season it is in the code block and assign the correct layout: _LayoutSummer.cshtml, _LayoutWinter.cshtml etc. The layout file has another interesting feature called RenderSection. It is similar to RenderBody in that it will render a set of HTML from a view. InvalidOperationException: The layout page ‘/Views/Shared/_Layout.cshtml’ cannot find the section ‘FunnyMessage’ in the content page ‘/Views/Books/Index.cshtml’. We’ll continue in the next post where we’ll start looking at a new feature in MVC .NET called tag helpers. I need to know that, can i override just footer of a default layout for a particular view, .